Keep the romance alive 365/12 with these five out-of-the-box ideas for you and your special someone. There’s more to love than Valentine’s Day, so if you or your love have eschewed the ‘day of love’ on February 14th, let romance happen any time instead. That’s not to say you shouldn’t enjoy red roses, a bottle of bubbly and satin sheets if that’s your thing. But if you want to demonstrate that love is truly a many splendoured thing 365 days a year, here are some five top ideas to have a non-Valentine Valentine's Day. Try a fun fitness activity and have a bit of a spar! If you don’t already go to a gym, find one and release some endorphins together under the supervision of a personal trainer. You’ll both feel like you’ve fallen in love all over because it will make you feel good. It’s tough with kids, but when did you last do something crazy together? Hire a scooter for the afternoon and just go for a ride. Feel the wind in your hair, the sun on your face and finish it with a visit to the local farmer’s market or café with time for the just the two of you. Do you remember that night when you were about 21 and you discovered tequila? (Perhaps you remember the morning after better?) We’re not advocating you do the same thing but instead of a bottle of champagne, why not relive your younger years and enjoy a tequila together for old time’s sake? Stay at home, reminisce, talk through the night out on the terrace or balcony and enjoy the sunrise together. We may have a bit of a fitness-together-stay-together theme going here because here’s another idea to improve your happiness and fun together through exercise-induced endorphins. Head to your local Flip Out trampolining arena and spend the afternoon jumping with your partner – and if you want to take along the kids, they’ll love you for it too! Forget the big city hotel. 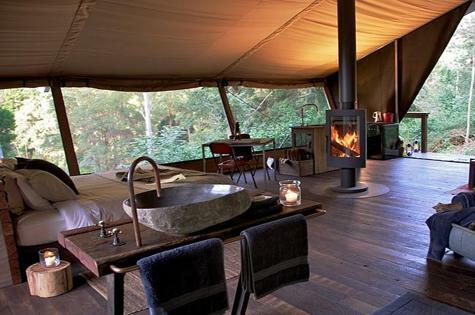 Enjoy the great outdoors instead in five-star style at some of the great ‘glamping’ spots around Australia. More and more glamping spots are popping-up around the country as people realise they can enjoy the best of both worlds – the beautiful big outdoors and a bit of luxury. One of the most stunning is Longitude 131 at Uluru, but there are many throughout the Australian bush and wilderness. One of our favourites is Nightfall Camp at Lamington National Park in Queensland (pictured below) - but check out the options at TravelMuse.com.au.